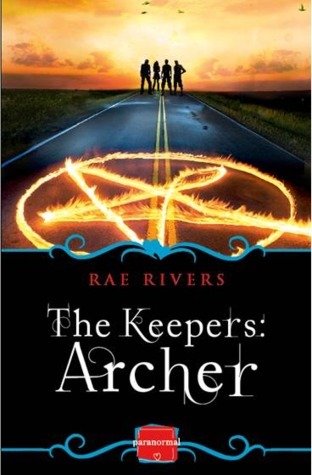 NOTE: I received a complimentary copy of The Keepers: Archer in return for my honest review. This does not in any way reflect upon my review. All thoughts/opinions of this novel are 100% my own. 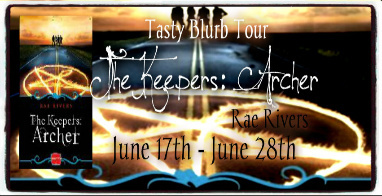 Lose yourself in the world of The Keepers, an exciting new Paranormal Romance trilogy from Rae Rivers. ******************** Book Excerpt: Sienna put a hand on Archer’s arm. “I’m going to find Warrick and get him to talk to me so we can go home.” Archer responded by sliding both hands behind her lower back and pulling her tighter against him so that her body was flush against his. She gasped at the sudden close contact and the intensity of his grip on her and tried to pull back to see his expression. “Just a minute more,” he whispered in her ear, keeping her in place as they swayed to the music. Her body shivered in response, his breathy words scattering her thoughts in an instant. “Careful, Archer, any closer and people will start thinking I’m your woman.” “You are my woman.” She’d meant to tease him, to ease the sudden possessive grip he had on her, but when his mouth edged towards hers, the gentle scrape of his lips against her skin and his whispered words ripped a soft shudder through her. “No.” “Not yet. In time, you will be.” She smiled against him. “Confident tonight, are you?” “I call it like I see it.” His fingers toyed with the seam of her dress at her lower back, and his lips hovered dangerously close to hers. “You know we can’t.” “I’m not in the mood to please The Circle right now and besides, some of the best things in life are the things that are forbidden.” “What are we, Adam and Eve?” His face softened in a breathtaking grin and in a gentle movement, he released her, twirled her around, and drew her back to cradle her in a possessive hold that enthralled rather than annoyed her. She longed to throw caution to the wind and kiss him, take what he offered, and lose herself in this gorgeous man. Screw the consequences. Instead, she opted for the safe route. “Stop it, Archer.” “Scared to admit the truth?” “No.” “Liar,” he breathed against her lips before pulling back. She blinked, trying to ignore the flash of desire that raced through her body and pretend her senses hadn’t just been overrun by pure male sexiness. Wow. “I should go,” she said, needing some distance between them. After all, she was here for a reason and it wasn’t to spend the night in Archer’s arms – on the dance floor or otherwise. The silent motion of his head agreed with her, but she could see that he was worried. She didn’t blame him. Beneath her cool façade, even she was worried. But she had a plan. One she wouldn’t share with her Keepers just yet. And she hoped to hell it worked. My Review: The premise of this book along with its cover (not even going to lie) drew me in from the start. I was expecting what I've come to term the "normal" of a paranormal romance (at least for the most part)... little if any drama, characters that are under developed and make you roll your eyes every few seconds - you get the idea. However, I am happy to say that this book contained NONE of that! 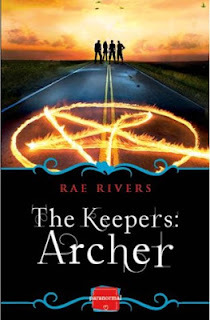 Overall, The Keepers: Archer is a wonderful blend of witches, keepers of magic and intense story-telling that I would definitely recommend! I am already hoping that I will be lucky enough to be picked to review the next book in the series when it becomes available! Hi, Krystal. Thank you for having me on your blog today and for the lovely review! So glad that you enjoyed the book!